When I found out I was pregnant with Liam, I had just started a new job. After the first day, I got into my car, called Chris and immediately started bawling as I cried, "But how can I do this job and be a mom and work and what am I supposed to do?" As my pregnancy progressed, we went back and forth with the idea of me continuing to work or not. During that time, Chris decided that he would return to school for nursing while we have just one kid in the picture, so that solidified our decision pretty quickly that I would indeed continue to work. 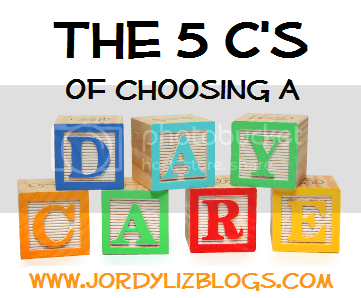 We toured five different daycare facilities before making our decision. Being completely new to the process, we were learning as we went along. Almost two years later, we could not be happier with the place Liam calls home during the day. He is thriving and learning, and it is amazing to see and hear what he has learned each day. I love that he runs into his class each morning and rarely looks back. In fact, there has only been two times since he was three months old where he has cried at my leaving. This is so assuring to me that he truly loves his school, teachers, and friends. So, what do you look for when searching for the perfect daycare? It's no secret that the cost of daycare is a kick-in-the-stomach to your budget. We are in that sacred spot where my take-home pay after daycare is still on the positive side and very much needed. But, still, it costs a lot. Once you figure out how much you can afford a week or month, different places have different rates. Most places we looked at had a weekly rate regardless of how many days you would use. They also required you pay at least half of the weekly rate if you were ever going to be out of town in order to "hold your spot." While this is great if you plan on working five days a week every week, I work on a school calendar (minus all of the long breaks!) where we get random school holidays and I take time off at Christmas. We ended up choosing a place that offered a daily rate - you just pay as you use it. This definitely saves us money each month and was a huge factor in our decision. Where this really comes into play is if Liam is sick, I don't have to pay for a day of missed daycare and a co-pay at the doctor on top of it. And the two weeks I take off at Christmas can be moved to the Christmas fund without us feeling the hit as much. How many days a week will we need daycare? What are your daily/weekly rates? What happens if we miss a day? Do we get an allotment of "sick days" where we don't have to pay if we miss? How often do we have to pay? Weekly? Monthly? So with that cost, what does it include? When it comes to meals and diapers for your child during the day, those are typically a convenience of a daycare and not a requirement. Many daycares provide snacks, but not all of them offer meals. As we toured, we were sold on the fact that our daycare not only provided breakfast, lunch and snacks each day based on the five food groups, but they also provided diapers. Diapers! This is huge, huge savings for us each month. I literally drop Liam off at school with the clothes on his back and they provide the rest. Do you have time to make breakfast and lunch in the morning to send to school? Does your child have any specific allergies? What meals and/or snacks do you provide? If not, what are we expected to provide? Do we get a copy of the menu each month? Do you have a menu we could see? Do you provide diapers and wipes? If not, what do we need to bring and how often? This stood out to Chris much more than me, but now I am appreciative of his keen eye. When we first started Liam in daycare, he was just three months old in the infant room. The first place we toured required that we put on booties to enter the room. It never struck me that we were tracking in our street shoes onto the floor where the babies were rolling and crawling around, so I was glad to see they were cognizant of that. This was good to see, because the next place just invited us in. I was mindful of not walking on the rug at least! The place we chose has a half door that allows you to pass your baby directly to the teacher without walking into the room. The teachers even have special shoes they wear specifically for the classroom. They also send all of the toys to a sanitation center each night, and all of the sheets are washed and used by only one child each day. Mattresses are also sanitized each night. Obviously, once you get to the toddler age, this is not all as important, but it was helpful to see the expectation of cleanliness they have as early as the infant stage. What level of clean is important to me? How often do you sanitize the toys? Do you wash the sheets each night? Mattress? Will my child have his/her own set of sheets each day? If Liam is going to be out of my arms for eight hours a day, I want to make sure he is learning and thriving. Each place we visited put a great focus on a specific daily schedule and centers where the kids would learn everything from math to letters to science. He has a specific schedule they follow each day, which is great to know as working mama. I can look at the clock and know that he's eating or napping or just waking up. What makes it even better is that if we follow that same schedule on the weekends, it works so, so well. Integrated between meals and naps are times for math, story time, science, art, outside play, songs and so much more. He comes home singing songs and naming objects which just reassures me how much they are teaching him. What are my expectations of what he/she should learn? When is nap time? How often do they nap? What do we need to bring for nap time? Are we able to see the curriculum each week? You want to feel like the place your child is at each day is a safe, warm, loving place and you want to feel beyond confident in your choice. Watching the teachers interact with Liam continues to make me more and more confident. They are truly excited to see him come each day, and the staff is always welcoming as well. What environment do you want your child in? And as you see the facility, how are the teachers interacting with the kids? Each other? Parents? What are their expectations of students in regards to behavior? What is their discipline policy? Overall, it's a big decision and not one to be taken lightly. It's hard! But beyond all of these questions and options, you'll know when you walk into the right place, that it is the right place. I don't have kids but I am pinning this post for the future. Very informative. Thank you!